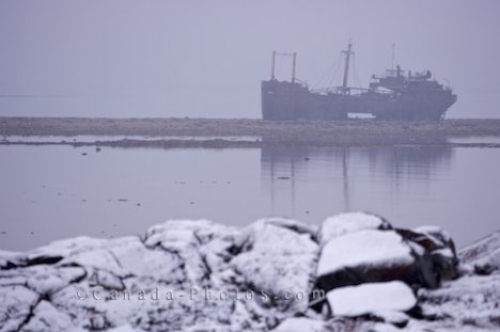 The coastline of the Hudson Bay near Churchill, Manitoba is blanketed with snow and ice as the remains of a shipwreck, the M/V Ithaca sits in Bird Cove surrounded by the low laying fog. The M/V Ithaca has sat along this coastline since it ran aground in 1961 and viewing this shipwreck is clearly visible when the tide is at its lowest or when the Hudson Bay takes on its winter ice. M/V Ithaca, a shipwreck in Bird Cove, Hudson Bay, Churchill, Manitoba, Canada. Picture of the shipwreck, the M/V Ithaca, encompassed in the fog in Bird Cove in the Hudson Bay in Churchill, Manitoba.